The “COMPOV” service center realizes repair of laptops in Borispol with the hardware and software failures of any complexity. Call us at 066-425-35-18, and a laptop repair will be done qualitatively and as fast as possible. Why is the diagnostics of a laptop necessary? It is not always possible to measure a cause of a laptop defect “by eye”. In such cases it is necessary to make diagnostics. Diagnostics happens in two types — simple and complex. In case of simple diagnostics our expert defines failure within several minutes by survey of a laptop. 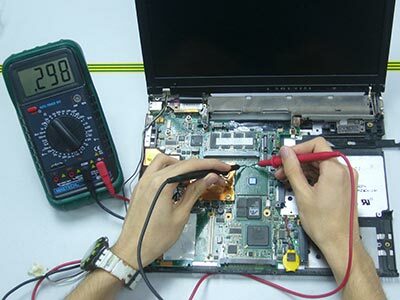 Complex diagnostics requires disassembling and testing of each detail of a laptop and takes several hours. The diagnostics is free in case of repairing at our service center. The laptop is more susceptible to breakages because it can unintentionally be dropped, flooded with water or hited . 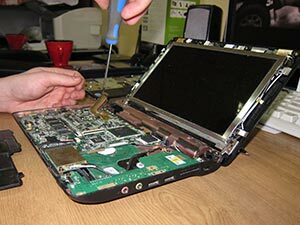 Depending on complexity and degree of breakage, laptop repair can take from a couple of hours up to several weeks. So, for example, changeover of a matrix (in the presence of necessary model) takes 20 minutes, changeover of keypads — takes even less time. Thanks to long-term experience, we work with suppliers of spare parts at rather democratic prices, that allows us to carry out repair at lower prices. 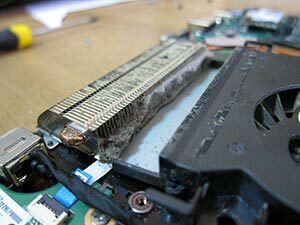 As there is an air cooling in the majority of laptops, then a notebook gets dust together with the circulating air, which collects and closes an output of hot air outside. It can lead to overheating and breakage of a laptop. To clean a laptop from dust, it needs to be disassembled. It is better to entrust this procedure to the professional, so you will avoid accidental breakage of a laptop during cleaning. Cleaning of a laptop takes from 30 minutes up to an hour depending on its model. To prevent breakage of a laptops, it is necessary to clean it from dust minimum once a year. 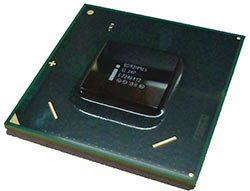 We carry out changeover of chipsets, video chips and other chips in laptops. Time of laptop repair depends on presence of spare parts. Such changeover takes from 3 days up to 2 weeks.